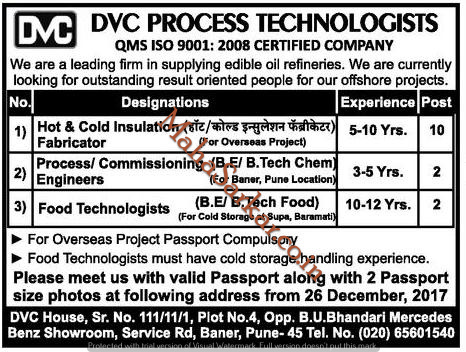 DVC Process Tech (DVC Process Technologists), Pune Published Job Notification for 14 Insulation Fabricator – Food Technologists & More Posts. Candidates who wish to apply must look at DVC Process Tech Recruitment 2018. Eligible candidates can apply offline before January 2018. Interested & Eligible candidates can send their application along with all the necessary documents and testimonials to DVC House, Survey No. 111/11/1 , Plot No. 4 , Opposite B. U. Bhandari Mercedes Benz Showroom ,Pune Bangalore Hwy Service Road ,Baner, Pune-411045. Starting Date, Last Date to Apply offline at DVC Process Technologists which candidates should be remember as follows. Start Date to Apply offline: 26-12-2017. Last Date to Apply offline: January 2018.